Fig. 15-6. Motion in Inertial Space of a Point, R, Fixed on a Nutating Spacecraft With /, = > /3. Origin=L, o=Pj, X=u,«=R (arbitrary point fixed on the spacecraft); ■<= arbitrary point fixed in inertial space. 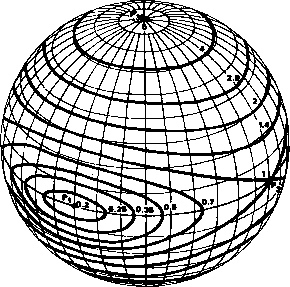 (such as the geometrical z axis), fixed in the body of the nutating spacecraft The coordinate axes in Fig. 15-6 are fixed in inertial space with the angular momentum vector at the origin. The symbols X, o, and • mark the directions of w, P3, and R, respectively, on the plane normal to L. Thus, the dashed line is the line connecting the centers of the body cone and the space cone and the X along the dashed line is the point at which the two cones touch. The heavy solid line is a line fixed in the spacecraft joining the principal axis to the arbitraiy point, R. The light solid line traces the motion of R in inertial space as the spacecraft rotates and nutates. The nutation angle, 0, is assumed small. For the case shown, /,=>3.5/3. Therefore, up=2.5u>; and the inertial spin rate, u=3.5«,. That is, in one revolution of the dashed line, the heavy solid line rotates 3.5 times in inertial space and 2.5 times relative to the dashed line. In a single frame, the dashed line rotates 36 deg and the heavy solid line rotates 90 deg relative to the dashed line and 126 deg relative to the edge of the page. 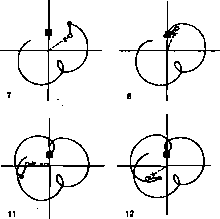 Figure 15-7 is identical with frame 12 of Fig. 15-6, except that the point in the body which is followed is farther from the axes and the positions of R and P3 for each of the 12 frames have been labeled. As seen clearly in this figure, a point in the body at an angle from P3 will always be between (A>—0) and (<p+0) from L.